Ramblings of a very tired mom. Today was a long day. It started at 5am with a trip to Medical City for Eva's scans. Today's scans were her one-year post-chemo scans. Your chance of recurrence is greatest within the first two years, however, the first year scan is a biggie. In the 20 months we've had this, we have never had clean scans. Back when we found the gigantic tumor, we had it removed in March 2008. However, it had pressed right on her spine so there was some residual tumor left. 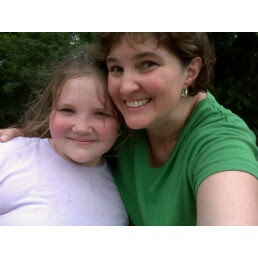 In June 2008, we found out that the residual tumor piece decided to grow so we had to start chemo. Post chemo, all the remaining tumor had gone away except for one small piece close to her lower belly. It was in a weird location so after meeting with our oncologist and our surgeon, we decided to leave it there and watch it. All the scans throughout this year have been clear except for that little piece of tumor, which was not growing. Leading up to the past two weeks, I've been a bit preoccupied with thoughts of the scan. Eva says her tummy hurts, is it cancer? Is it the flu? Is she just being a dramatic 3-year old? Who knows?? Everything seemed to take me to cancer. Eva has black circles under her eyes, a sore tummy, she's not eating, her body aches, she's running a small fever, her breathing is labored. What are these all symptoms of? Cancer. Oh, and a really bad cold. Prior to February 2008, I was probably the most apathetic Mom when it came to these things. I'm like the news, if it bleeds, it leads. Beyond that, I was pretty calm. But, once cancer enters your house, your ability think rationally changes completely. So, here we were to today at the hospital. Pretty normal stuff. Eva came out with flying colors thanks to the World's Greatest Anesthesiologist, Dr. Davis. One thing that sort of bothered me a bit, however, is that he had her back for over an hour. Usually, she's only in for about 40 minutes. Not to panic, just sort of wondering. 8am-Called the doctor's office, just to leave my mobile number for the results. 10am-Got back to the office. The timer had started. Usually, I hear back from them around lunch time. Ok, I can wait two hours. I pick up my cellphone and literally carry it with me everywhere in the office. Tick tock tick tock. Lunch-What did I have for lunch? I don't have a clue. My stomach was in knots and I just had one thing on my mind. I start talking to my phone "Ring!!! Ring!!!" 1pm-I've now called two times. "This is Kristi, again, just checking in on Eva's results..."
2pm-Starting to panic. Strange that they have not called yet. I've now called three times "Hi there, don't mean to bother you but, this is Kristi, just checking on Eva's results..."
2:30pm-I'm starting to freak out. What is the delay? Why have they not called??? 3pm- Welcome to Crazy Town, Population 1. What is the deal? Why no call??? Are they waiting to hear back from Sloan Kettering because they had to call in someone?? Has the cancer spread so much that they are trying to just figure out how to tell me???? Are they off for an afternoon of golf?? I DON'T KNOW!!!! Ring, damnit, ring!!!! I can't sit down, I can't think about anything. 3:20pm-Phone rings. It's the nurse. She says that the scans are not yet read. She told me that they have been checking on them all day but were still waiting on the results. I'm completely calm, "Oh, no problem, just sitting here waiting for the results. I'll just wait a bit longer." 4:30pm-Sitting in Jack's Parent Teacher conference with Jack's teacher and the head of the school (yep, it's been one of those years with Jack). Phone rings. For the first time since February 2008, Eva has No Evidence of Disease (NED). The tumor that was there in her belly was completely gone. No sign of any tumors anywhere. We meet with the doctor at the end of the month. As far as I know now, we'll still closely scan her for the next year, as per the regimen. After two years, we get to scan every six months. Then, we'll go on from there. As for us, we celebrated HARD last night. Bought a cake that Jack picked out, had champagne for us and "champagne" for the kids. We toasted and cheered and laughed and had a great time. When Jack came home from school today, he informed me that he needed to write a letter on behalf of his friend Conor and himself to President Obama. I was asked to write it so he could mail it. We are going to tear down the playground and rebuild it with I-beams, bricks and wood. We would like for you to take off from work early and fly from Washington, DC to Dallas to come to our school to help us build the playground. We want you to come so that our Moms and Dads can stay at work and get their stuff done. Thank you. I hope you are well on this fine Tuesday. For most of my Virginia pals, today is the first day of school. Welcome back, y'all! Gosh, so much to talk about. We're all well over here. Kids are back in school (see previous post) and doing very well. Jon has agreed to coach Jack's soccer team this fall. This is hilarious on so many levels. Neither one of us could be described as any sort of "athlete" and the thought that we are somehow in charge of training kids is hilarious. So, Jon and I have been researching soccer drills, etc and gearing up for the big first practice tomorrow night. I'm sure I'll keep you posted on the season. Go Jaguars! This weekend, we spent Sunday doing what we love to do on Labor Day, at WestFest, a polka festival in West, TX. Gosh, we have such a great time! The kids run and play and dance. I get to see my good friend, Sandy and polka with her and her family. It is just a blast. I was telling my friend earlier today that my favorite part of the festival is watching the group of about 35 fifty-year olds in matching tie dye shirts jumping up and down and laughing so hard they can hardly stand while doing the "Hokey Pokey". That's what it's all about, my friends. Here's two shots of us. One of us doing the "Hokey Pokey" and the other of us with the Czech Festival Ambassador, Rosie. You have to just love her. Jack has been on a tear recently with these imaginative stories. First, he came home from school the other day and told me that he and his friend Cash were going to build a theatre in our front yard. When I say he told me this, I mean, he told me in GREAT detail. First, Mom, we're going to use the left over wood that our contractor left behind. Then, we're going to go to the Home Depot and get "several" pieces of extra wood. The theatre is going to have one big room that we are going to paint black. Then, there will be an extra room in case someone else is using the big room and we need to do a play... on and on. The play would be about Indians but they would not use real arrows, he assured me. He even drew up plans for me. He has also referenced the theatre about every other day since then. When can we build it, Mommy? Oh, I'm sure the neighbors would LOVE that! Today, I came home and Jack leapt into my arms and told me a story about the day. Apparently, he saw Eva on the playground today shortly before she took off on the jet-ski at 100mph that happened to be nearby. She also gave rides to all her teachers and fellow students. He said that his friends were like, "wow, who is that person on that jet-ski?" and Jack said he told them that it was his baby sister. The sad part to the jet-ski story is that apparently the army came and picked up the jet-ski's when they discovered that they were supposed to be used for snow skiing and not for zipping around the school at 100mph. Jack assured me that the "army" was not mad at them for having the jet-ski's and that he was not arrested today. Whew! I'm not quite sure where Jack's going with these stories but they sure are getting grander and more interesting. For now, I'll just enjoy them and look out for raccoons zipping by the house. Well, this post is a couple of weeks late. I did not post immediately because I needed to have my photos doctored a bit to take off the name of the kids school from Jack's shirt, our house address, etc. I know, I know. I'm paranoid. Most of the folks reading this know EXACTLY where the kids go and EXACTLY where I live but since this is my blog, you can never be too sure! 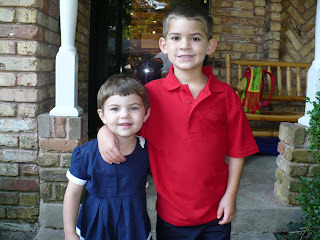 So, here they are on the first day of school. Jack and Eva now both go five days per week. My big boy, Jack is an actual Kindergartner. I can't even believe it. The very cool thing about a Montessori school is that ages 3-6 are in the same classroom. So, Jack is year three and that comes with lots of responsibility towards the younger kids. I'm really hoping it does wonders for him this year. Eva has taken to her school like you can't believe. I love that I get these notes from her teacher telling me stories about the things she is doing. I got a note the other day from her teacher that Eva had advanced so much in the class in one week, they created a "big kid shelf" in honor of her with work that they usually don't pull out until later in the year. You go, Eva!!! Anyway, here they are in the doctored photos. I told my awesome co-worker (who did these for me in like two days, I was just too lazy to actually post) that if she was going ahead and doctoring them, maybe she could make me like 60lbs lighter. That would really help me in my Weight Watchers. Alas, she didn't. Too bad she does not work for Vogue. Last night, we were in Target waiting to get her hair cut and Eva just burst into song. It cracked me up so much!! So, today, I recorded her singing two versions. The first was what I heard last night. After we recorded it, Eva said, "Eva do it, again!" and I taped the second version. It made me laugh so hard!! We hardly let the kids watch any television so I'm not sure where she learned it but she did! So, we've had an interesting week this week. I came home from work on Monday to find that Jack had completely chopped his bangs off of his head. To make matters worse, as I was cleaning up his room, I found this in an empty bucket that I had just purchased. Anyway, Jon and I were VERY unhappy and on Wednesday, I took him off to the barber to get his hair evened out. I mean, school starts on MONDAY! First day of school pics are MONDAY! grrr. Fast forward to Friday. I come home from work and I take a look at Eva and I'm like, what is wrong with her hair? It looks so strange. Hold it. Eva's bangs have a huge chunk taken out of them. Off to SuperCuts AGAIN!!! Poor girl. I mean, it took her two years to get any hair at all. As soon as some was growing in, she started chemotherapy and lost it all. THEN, when it was finally growing in...bam! Barber Jack. I was really unhappy. Here she is now. You can see the post below to check out her 'do last week. So, tried to think of an effective punishment for Jack. Finally came up with two. One, he had to miss the two birthday parties for his three close friends today (a punishment for me, too, because I missed seeing the other Moms!) and two, he had to take out of the commercial money that he received for his NFL ad that he was saving to buy a camera and pay for the two haircuts. The truth is, I felt horrible about the punishment. Jack has been an angel today and I really wanted him to go off with his friends. But, had to do what I had to do. I just have to take a look at Eva to get over it. A friend of mine recommended that I sleep with one eye open since Jack might be in search of a new "client". Good advice, indeed! My time with my kids at Camp Grandma ended on Thursday with my arrival in NC. We had decided to take the kids to Myrtle Beach for a couple of days since my kids had not been to the beach all summer. So, off we go as a family. Six kids under the age of 8 and four adults. We had a blast. The kids played and played. Eva especially loved being pulled around on a boogie board in the tidal pool. Jack, he was Mr. Sandcastle. I also taught Jack when to jump over waves and when to dive into them. He had a ball. After we left the beach, we went to dinner in a part of town called Barefoot Landing. Off in the distance, Jack saw a bungee jump. Now, let me just say I am completely against this kind of thing. Call me crazy but the thought of my child landing on his head just scares me to death. BUT, I'm not sure what got into me, Jack asked to do it and I said yes before I thought better. That said, Jack LOVED it! Check him out!!! My best friend, Alex, and another girlfriend, Nicole, tagged me recently in their facebook posts that lists 50 Bands/Acts that they have seen in their years. Ordinarily, I don't participate in these things but this one was really fun. Since I go to so many music festivals and I can name 50 bands I saw this past April at Jazzfest, I tried to limit myself to those concerts that I actually paid money to see individually. So, today, I was cleaning out my wallet and found this receipt. Check out who my waiter was at this meal. Actually, did have lots of fish tacos and some water. Coincidence? I hope you're having a fine Tuesday. For me, it is LEAPS and BOUNDS better than yesterday. Yesterday, I woke up the same as I had for the past week or so in a panic over Eva's test results. Today, I was able to wake up with the knowledge that all was well, at least for now! It is a great feeling, I tell ya. Today is a special day for many reasons. It turns out that today is my dear friend, Whitney's 40th birthday, my dear friend Kathryn's birthday, our "honeymoon buddies", the Wilson's, 8th anniversary, and my niece Ella's 4th birthday. Quite a special day. Jon is up in Boston right now on a business trip but spending the evening with Ella on her special day! Happy Birthday baby girl! I'm holding down the fort here in the Big D. Things are cooking around here. First, we are doing some remodeling. FINALLY getting our new windows that we have been wanting for months. I swear, it looks like a new house! AND our electric and gas bill will go down significantly, now that we don't have windows that will not close all the way. You know, when you do minor repairs like painting and windows, it makes your house seem so new! Next stop, having all ceilings painted inside the house, painting Jack's room and getting a new coat of paint in our den. WAHOO! New Goodnight Mom house!! Ok, here's the thing. The fact is that our nanny goes home at 5:30 and it is SUCH a stress that I have to make sure I leave the office no later than 5:00pm EVERY SINGLE day! Does not matter that I'm in the middle of something or that I have a meeting. I have to race out the door. It is so hard! BUT not next week! Jon and I have so much planned! Wahoo! AND our 8th anniversary is coming up two weeks from today. Since Jon will be out on a business trip, we're going to celebrate a bit early when the kids are gone. So, I asked Jack what he was looking most forward to seeing in North Carolina. He told me that he was most excited about the "b-e-a-c-h". He cracks me up when he spells things. The kids have been on a roll recently. I was so sad that Jon missed the antics at dinner last night. Jack informed me that when he was going to NC, he was going to call an "emergency meeting of the boy's club". Hmm. Ok, Jack, who's in that club? "Me (5), Davis (3), James (8 mos) and Andrew (3mos). " Wow. That will be quite a meeting, Jack. What will you discuss? "Well, the first thing is that we have to find a new director. I think that Andrew should direct the meetings." THAT is something I'd like to see! Jack, what about your sister and your BFF cousin, Claire? "Well, since they are girls, they can come to the emergency meeting of the boy's club BUT they cannot direct the meetings. Only boys can direct the meetings." Jack, you were born in the wrong era, my friend, if you think that will fly with those strong-headed gals! It was hilarious. He just went on and on. The funny thing is that I could not discover why there needed to be an "emergency" meeting in the first place. What did they have to urgently discuss? I told my sister that she needed to attend to take some notes. That will be very important to make sure they cover all their agenda items. Also last night, Jack was going on and on about something. Eva turned to him and said, "Jack, stop being such a cwy baby." I fell out of my chair. 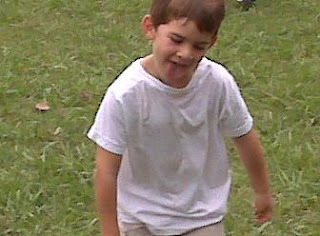 There is one word in our family that reduces the children to hysterical laughter no matter what they are doing. That word is "spaghetti". Eva can be throwing the biggest hissy fit and you look at her and say the magic word, she bursts out laughing. It is the answer to all knock knock jokes. (example: knock knock, who's there? Spaghetti---nothing else needs to be said. Hysterical laughter ensues.) What makes that word so funny? I don't know. I just keep it in my arsenal. Ok, here's a real confession. Tonight, I was in the restroom. The phone rings. Eva runs over to the phone and answers it. I hear her say, "Nope. She can't. She's going poop. Good bye." I sure hope it was a telemarketer. Today, Eva had an MRI. Right now, we're having her scanned every three months. We ran into our doctor in the elevator on the way back and he said he would call us as soon as he had any word. A couple of hours later, we got the word that the scans were good!!! The small tumor that was left behind is, "hardly noticeable." That's movement in the right direction! What does that mean, well, we go to the doctor next month and then scan again in November. I won't go on and on about my emotions with this news. I will say that I have a bit of a delayed celebration. You just get so prepared for the bad news that it takes some time to get your head wrapped around the good news. It is such an emotional roller coaster. Feeling better now. Of course, I have Eva asleep in my bed waiting for me to snuggle. Never gonna let that gal go. So, hush little baby, doono't yoooou cryyyyyy""
Pretty much the story of our life here in Goodnight Mom land. Maybe you all remember last year we had a flea infestation in our home. Well, here we are, again. Round 2 of the fleas. For those new to us, this is a strange occurance as we have no pets. No pets at all. Not a one. So, when I ask them what is happening and why we seem to be a haven for bugs, he said that it is because we have wild animals running through our yard. I'm not sure that is the case. So, we had someone come out last Friday and spray the house. Apparently, there is one stage of a flea's life that is not affected by this spray and we have to wait for them to all die. We got some great news with Eva today! Her cathecolemines were the lowest they have been EVER since we started this process! WAHOO!!! That is such wonderful news! We are doing an MRI next month and we'll have more to report then! As for Eva, I'm attaching a little video of Eva's antics tonight. Her "monster" impression reduces me to hysterical laughter each and every time. As for the other part, well, maybe we spent too much time at the museum and on You Tube this past year. My kids love them some Steve Martin! Well, it has certainly been a while for me since I have written. Lazy summer nights, combined with a bout of strep throat. Just exhausted. This will be a bit of a hodge podge of confessions and updates. 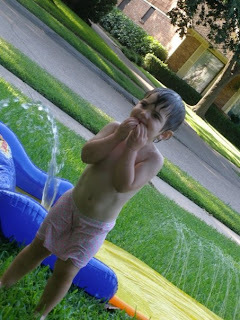 We're all here enjoying all the heat and fun that summer in Texas brings. More heat than fun, but hey, it's all good. 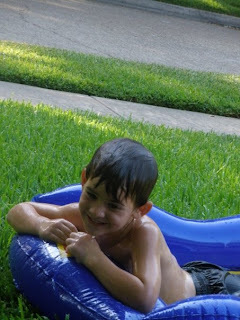 Here are some shots my niece took of the kids on the slip and slide in the front yard. God bless whoever invented that thing. Well, for July 4, Jon and I ended up going to Napa Valley to visit some friends, again this year. Our wonderful friends, The Stulls, were so kind to host us, yet again. We had a relaxing three days filled with friends and wine. I won't go into the drama of non-revving (airplane employee-speak) on a holiday weekend. I'll just focus on our time there and say it was perfect. AND I got yet another break from the Dallas heat! Wahoo! Two shots from the trip. One of my hot husband at our friend's house and one of the two of us. I'd like to send a special thank you to Jon's parents for agreeing to keep the kids! THANK YOU! We got back from our vacation and our niece Limor came in to town. Limor lives in Israel and we don't see her very often. As a matter of fact, it had been nearly 2 years since I had laid eyes on that girl. Way too long! We had such a nice time with her!! 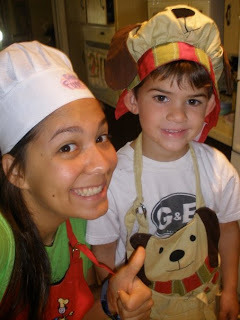 Jack and Limor decide to bake a cake! Whenever Limor comes to town, we watch High School Musicals. It is our thing. I can now officially say that I have seen all three. The Trilogy, if you will. Admittedly, no one loves a good musical more than I and I'm especially a sucker for a good high school story. My review? Of the three, I have to say that the first one is the best, followed by the second and the third. There were some good songs, though, but none as catchy as "We're All in this Together". By the way, I have used that song TWICE this week at work as an example of how a group of folks can work together. Speaking of work, I'm playing on the office softball team. We have an intra-Y employee tournament next Saturday. I'm the coach/organizer of the team from the Association Office. This is hilarious on so many levels. My first practice, I grabbed Jon's lefty glove on the way out the door. So, I had to attempt to catch the ball with the wrong hand. I did great until I tried to catch a screamer hit by one of our guys and I ended up catching it with my wrist. It immediately swelled up and turned purple. REALLY purple. When I told my father what I was doing, he told me that at my age, the only thing I should be running on the softball field is the concession stand. I played regularly on a work softball team when I lived in Atlanta in my 20's. To say I was terrible does not even come close. But, they needed a girl and I would show up and play catcher. Yeah, a 5'11" catcher. I could actually catch the ball and that was the place that I did the least amount of damage to the team. Anyway, it was the final game of season 2. My dad happened to be in town and came to support me. I got up to the plate and hit a double! My team went wild, screaming with excitement!!! My father was there and said, that he was very proud of me but did not understand the excessive celebrating done by my teammates. What he did not realize was that was the first time in two seasons that I had been on base. The other night, I stayed up for hours and hours watching Square Pegs on Hulu.com. (see confession above about high school stories) I just love that Sarah Jessica Parker in her awkward younger years. Gosh, that was a great show. As for the kids this summer, well, it's just been a bit challenging, to be honest. Not having them in school, they are just running wild and Jon and I are struggling to keep them in line. They are having a great summer, though. They are both at camps and are having a blast. Eva is getting so big and so articulate (for better or for worse). For better in that we can understand much more of what she is saying. For worse, her opinions about EVERYTHING are getting stronger. Jack never cared which bowl he was given or what clothes he wore to bed. He as just happy to get anything. Eva, not so much. She wants the pink spoon and the blue cup and the Sponge Bob pj's. Such a difference! Her spanish is also getting better and she is starting to distinguish between the two languages in which person speaks which language. Jack picked this up MUCH earlier than she but it is great she is coming around. She still does not speak in spanish as much as I would hope. If you talk to her in spanish, though, she'll answer you correctly. Just in english. Soon, I hope! The best thing I can say about Eva is how she greets you when you enter the door. When I turn down my street, my smile just widens because I know what is coming. I see that little girl open the door and come running out and JUMPS in my arms...MOMMY'S HOME!!! Man, it is awesome. The cool thing is that you don't have to be gone all day to get that reception. I went to the store to return a movie the other day. I returned about 7 minutes later to the same greeting. Sometimes, it makes me want to just go drive around the block just so I can come home. As for Jack, he's spent the summer on many projects. We're having our house painted so he likes to assist the folks doing that. Jack is a helper. He wants to help with everything from cooking to cleaning to baking to packing for a trip. Jack is my little helper. 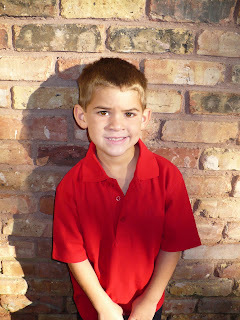 This summer, he has focused on his reading every single night and is starting level 2 reading books at age 5. I'm right proud of him. He needs some work on his motor skills with his writing, as that is about an age 3 or so but he'll get there! He is also suddenly interested in building things with recycled materials. The other day, he told me that I could not throw away the old cereal box because he was going to build a puppet theatre with it. Ok, Jack! Looking very forward to seeing that! It's good, though. He is far more conscientious about the environment than I was at 5 or 25, for that matter. Took Eva to both the pediatrician and the oncologist this week. I am happy to report she is perfectly proportioned in height, weight and head size. 50-75%. Good job, Nubbin! We'll have the results of the catecholomines in a week or so. Then, an MRI in August. That's about it for us. I'll end with a shot that I took a month or so ago. We were on our way to a Cancer Survivor's picnic. Eva did this entirely on her own and turned to look at me just as I snapped this shot. It is one of my favorites of the kids. Well, after much discussion, we decided to take a trip to Napa for July 4th, again this year. Our dear friends, The Stulls had invited us to their home for a party. We had such a great time last year, we could not pass it up! So, today was the big day for the commercial. Jack woke up bright and early and was PSYCHED! So, was I, to be honest. We were going to have a fun day. Yesterday, I had gotten a call from one of the assistant directors that our call time was 9am since we were super special and they wanted Jack for a different role. Off we went to the fields. We got there and they pulled us outside right away. They had one child Chris and put him in a different shirt. Meanwhile, another assistant director came up to me and said, "would you mind being in the commercial? We need you to push your "daughter" on a swing. Would that be ok? I love your green shirt." So, one of the other Moms took care of Jack and I went off to the swingset with my new 10-year old daughter, Logan. I get back and then they said, ok, that's it! Turns out that they wanted Jack as a BACK UP if they did not like the kid that they were hoping for! BUMMER! So, Jack just ended up being in the group ad. Mom, however? In the main ad. 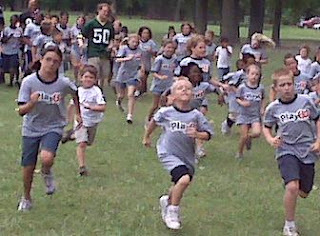 Then, they brought in the other 50 kids and for the next four hours, they ran Jack back and forth. I can't believe that he made it! In the commercial were: Hines Ward, of the Pittsburg Steelers, Antonio Gates of the San Diego Chargers and AJ Hawk of the Green Bay Packers. 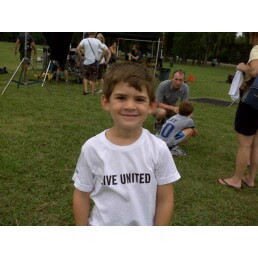 So, if you are watching football this season and see a group of kids running around in a United Way ad, see if you can spot Jack! And if you see someone chasing another kid around in a field, look off into the distance and you'll see Goodnight Mom and her daugther, happily swinging. Here's your Where's Waldo moment. Can you see Jack?? Jack after about three hours. 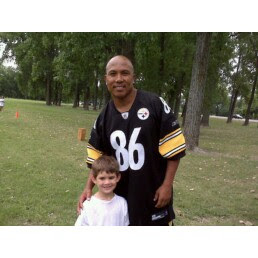 Jack and his new friend, Hines Ward. Last week, I received an email from our CEO that they were having try outs for 5-12 year old "regular kids" for a nationally televised NFL/United Way commercial that was shooting in Dallas. So, I thought it could be fun to take my "regular kid" to see if he could make the list! Yesterday, I heard that he did! So, not only will he be in the group commerical, today, they called to ask if he was available to be featured in a different commercial! AND they are going to pay him $100! I told Jack that he was getting paid for this and his response was, "Mommy, they can't pay me $100, I'm only a kid not an adult!" Anyway, more on this tomorrow when we finish! 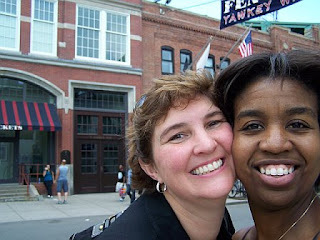 Went to Boston this weekend to see my BFF Jana. She's been going through a bit of a tough time recently and I just wanted to head up there for some girl time. We had such a great time. Here we are outside of Fenway (woot woot!) where we went to go pick up some updated Sox gear for the kids. Can I just say not only was it heaven to see my dearest, being in Boston in the middle of summer in Dallas is like being in God's air conditioner. I kept asking Jana to go outside. Last night, I slept with all the windows open...under a heavy blanket....ahhhhhhh. Arrived home today to 104 degrees Dallas. BAM! Back to reality! 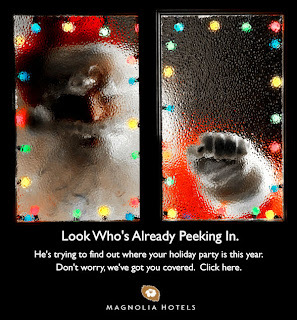 Does this ad scare anyone else as much as it does me?? First, a very happy Father's Day to all you Dads out there in cyberland. I hope you are having a wonderful day. Last night, Jon and I decided to take advantage of a little YMCA (who invented Father's Day, by the way!) membership perk, Parents Night Out. This is a deal and a half for us. Our kids get to spend the night out playing with other kids, it is SUPER cheap for us! So, we decided to take the kids to the Y and go see The Hangover (hilarious, by the way, in a raunchy, oh this is just wrong kinda way). We were feeling pretty good, I must say. Here's the flip side. We knew we would be paying for our wonderful date today. We did not pick up the kids until 10:30pm. Jack was half asleep, Eva was wide awake and bubbly. This morning, kids woke up bright and early. Since Sunday is my day to wake up with the kids anyway, I was up bright and early. Jack is fine. Eva wakes up and, boy, is she a treat. Me: "Eva. Here's your cereal." The charmer: "NOOOOOO! I WANT THE BLUE TURTLE BOWL!!!" This is followed by newspaper, napkins and whatever is near being chucked to the floor. My usual response to this is to carry her little bottom to her room and when the devil has decided to exorcise himself from her, sweet Eva comes out. Multiply this conversation by about 6 and that's how the morning went. Happy Freakin' Father's Day!!! Jon wakes up, (I'm sure the screaming and head-spinning-walking backwards on the ceiling Eva didn't help), and decides to have us celebrate his big day by going to the Dallas World Aquarium and to lunch. I'm thinking this is a pretty good thing. Get to the aquarium, Eva is a dream. She's laughing, having fun, holy cow, the Eva we know and love is there. I can get the priest off of speed dial. 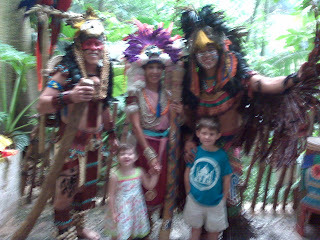 Here are the kids with our good friend Ricardo, who does a Mayan dance routine every weekend at the Aquarium. See how happy they look? We order our food. Eva decides that she wants to butter her own bread. I tell her that she can do the next piece. That was all she wrote. I tried to reason with her. This was to no avail. Toast got thrown. Shoes got thrown. Jon took her outside to let her "scream it out". Nothing. Eva was OUT OF CONTROL. Oh, did I mention that she also bit me? HARD! Yea me! So, in an effort to salvage Jon's Father's Day, I took Eva home for a nap. Jon decided to stay at the place we ordered lunch and I picked him up after Eva's nap. Jon's lunch spot? The pub, where he was for three and a half hours. No wife, no kids, and a credit card. Eva finally woke up. She was an angel. Happy, happy, happy! When we were in the car on our way to get Jon, she was in the back seat singing this song: "Eva is the sweetest girl, sweetest girl, sweetest girl. Eva is the sweetest girl..." Oh, yeah. She's sweet alright! Now, I have always loved going ice skating. I've never been necessarily skilled in ice skating but have always found it very fun. Jon played ice hockey in high school and often says that he married me so that we would have tall children so they could play ice hockey. Not sure how that's working out for Jon but whatever. So, back to the party. We all four get skates. I had thought that Jack would be a bit hesitant at first but then really take to it once he figured it out. Eva, on the other hand, is a bit picky on things she likes to do. She does things on her own time. Also, she often wants to be carried around most of the time rather than walk. So, I thought that this would not interest her in the slightest. Not so, Grasshopper. We get out on the ice. Jon has Eva, I have Jack. I told Jack that he had to wait on the side for just a minute so I could skate one time around by myself. I mean, it's been YEARS and I needed to get my bearings! As I made my way around, I skated at a snail's pace past Eva and Jon. I think I was blinded by the gigantic smile on Eva's face. She just kept saying over and over, "Mommy, this is fuuuun!" I made it back to Jack who was terrified. But, we made it once around together and he did great. I then decided that if I was with him, he would not learn. So, I had him go by himself by hanging on the side. By the end of the session, Jack was a pro! Eva? Well, not surprisingly, she decided after five minutes that she could absolutely do this on her own. She would not let us hold her for anything! We finally convinced her to let us hold her hand while she held on to the side. That seemed to appease her. When we left, Eva was sobbing. She kept saying, Eva skate! Eva skate! All in all, we laughed and laughed and had so much fun as a family. Who knew ice skating the middle of Texas summer would be so great. Yes, Eva it was fuuuuuun! As I write this, my husband has turned on Citizen Kane on TCM. Jon does not like old movies unless they are war movies (ugh) so it is a rare treat for me to get to watch a movie in black and white that we both like! I know that I write about this a lot but I do love old movies. I could spend all weekend long on AMC, TCM and FMC. Oh, and it if it is a musical, look out! I'm one happy gal. Jack and Eva play doctor a lot. Tonight, Eva was giving me a physical while wearing her doctor coat. She checked my blood pressure, took my temperature, checked my ears and then pulled down my shirt to "access my port". Then, Jack diagnosed me as having an ear infection with the treatment of chemotherapy. The good news, of course, as he told me, was that I would not lose my hair. He mixed a special formula of chemotherapy with medicine that makes my hair grow. Now, why has no one thought of that before??? I often wonder about the long-term effects of the last 15 months on the kids. Honestly, maybe it will be that they both just turn out as doctors. I can't imagine that practice, Dr. Jack and Dr. Eva. Both fighting to maintain control. Jack taking everything so literally, Dr. Western Medicine, Eva feeling their pain and wanting to practice some Eastern medicine. Oh, to be a fly on the wall there! Today, I almost got into a wreck on my way to a meeting. My lane ended and I was attempting to merge with another driver. She would not move. She was right at my passenger rear door. I could not slow down to merge because I was sure to hit her from the back side. So, I hit a couple cones as I tried to avoid her car. As I gave her some "signals" that said, hello there, madame, this is a merge lane, her signal to me was to "bring it on". I think if I had the chance, I might have punched her in the freaking face. Oh, sister, I would "bring it" for sure. I'm not exactly what you would call a violent person. I'm actually pretty even keeled. Mostly happy, even. I don't know why I wanted to punch her freaking face, to be honest. Make no mistake, however, I would have knocked her lights out. It's a MERGE! MERGE for goodness sakes! I spend a lot of time on Facebook. Let me be upfront and say that I just love Facebook. I love reconnecting with old friends. I love that this is a great way for my gigantic family to stay connected. It is so easy for us. 1) I hate hate hate hate the new home page. It's not that I hate the format, it's fine. I just hate seeing all the crap that all my friends are doing, no offense to my friends. I love seeing your pictures that you post. I love seeing your status updates. I love seeing your notes. It's just those "do you know me quiz" answers, mafia wars (?? ), so and so sent such and such a drink, etc. Why do I have to see all that stuff? It takes me 25 minutes just to check out what my friends are doing. Isn't that the purpose of this thing?? You post your thoughts and people comment on it? Why muck it all up with all that other jazz? I just don't get it. 2) Facebook even changed the "Friends" page. Even with the new formatted home page, you used to be able to sneak through the friends page to see just the status update. Alas, no more. 3) Can I have a bit of a moment of "Facebook Etiquette?" This is a small thing but I just have one request. If you are mad at someone, please do not use their "wall" or your status update to voice your grievances. This comes up on my home page. It is just depressing for me to log on to see what you're up to only to find that someone, like two high school friends, are mad at each other. This rule especially applies if you are a member of my family. Trust me when I tell you that this brings into action an immediate Goodnight Mom family phone tree. It's not pretty, I tell you. It's hours and hours of intra-familial discussion. I know this is a bit strange coming from a blogger who often talks about my personal feelings. However, when I rant, I don't usually rant about people that you actually know in person. This is unless you happen to be related to Dr. Senior Moment Lady or perhaps that person in the car earlier today. If you are, well, then I'm sorry. Truly, I am. See how sincere I am? One of my co-workers suggested that I take a look at this website called www.findyourspot.com It is basically one of those sites where you put in lots of information and it tells you what city/town in the US best suits your needs. I answered this completely honestly last Friday night. I did not restrict myself to any part of the US. I selected both medium and large towns. Just thought I would see where this site thinks I should live. Want to know the #1 suggested place? Norfolk, VA, my hometown. No kidding. It was hilarious! Guess I just loves me some hometown! Good thing is that Norfolk ended up in the top 3 for Jon so if I have to move back home, at least I can take my husband with me...whew! When I came home from work today, Jack was standing on a 7 foot ladder with a hammer, assisting our contractor with replacing some 2 x4's on the roof. I nearly had a heart attack. He was undaunted and when I was leaping over our grill and brick wall to catch to him before he fell, he very calmly came down. He then grabbed a piece of wood to measure it. He took a pencil from our contractor's pocket, grabbed measuring tape and wrote on the piece of wood the exact measurements of it. Then, he took the measuring tape, put it in his back pocket and put the pencil behind his ear before taking the wood to the contractor's truck. He looked 25 years old. I just stood there and watched my life pass before my eyes. My baby's all growd up. On the flip side, tonight at dinner, Eva grabbed her hot dog, rubbed it on her lips and said, "Hot dog makeup, Daddy!" I don't know why we just thought that was so hilarious. Maybe that would be a good fragrance for a new line of child lip gloss. Hot dog, cheeseburger, chicken tender...all their favorites. Hmmm, maybe I'm on to something! Goodnight Mom, needs your help! My hub and I are looking for a getaway for July 4 weekend. We have arranged for a sitter. Jon works for an airline so we fly for free. However, we have some financial constraints on where we stay. So, my question is, where should we go? Anyone have any good suggestions? I would love to go to a place we've never been before, which pretty much excludes most everything east of the Mississippi. Not all, so if you've got a good suggestion...I'll take it! That's it for me. I hope you all have a great week and if you see someone trying to merge, please, please, please let them in. This post is a week or so late. As I mentioned, I've been a bit lazy on the writing front recently. Last Wednesday, I was walking into our Board of Directors monthly meeting and got a phone call from my sister, Angela. She was in labor and off to the hospital. I went to my meeting and then raced to the airport to try to get there in time. You see, this is my sister's fourth child. We weren't sure exactly how long she would be in labor. I kept envisioning the scene from Monty Python's The Meaning of Life where the Mum is washing dishes and has the baby. "Get that, would you dearie?" Anyway, missed the first flight, sadly, no room. Got on the next one and ended up in Pinehurst at 1:30am. At 6:00am, my darling little Andrew Hubbard made his appearance. He gave us quite a scare at first coming out in a lovely shade of blue but Angela's doctor was quite masterful and he was pink within seconds. Andrew is a name they like but Hubbard is Dyda's and my father's middle name. That little fella has a lot to live up to! Andrew was 8 lbs 11 oz (I won the pool, by the way, I said 8lbs 12oz). Quite a chunky fella. 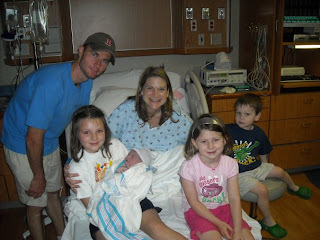 Now, my sister has two girls and two boys. The perfect little family. Angela was quite the trooper, as her blood counts did not allow her to have any drugs. I don't know how she did it. She looks amazing here! As for me, I was back at my desk on Friday morning. 36 hours from departure. Took me about four days to recover but totally worth it. Welcome to our family, little fella!!! Well, I'm home from the hospital. It was a bit of a crazy morning. Jon and I were trying to distract Eva from wanting something to eat and drink by showing her television, an unheard of treat for a weekday morning! Eva went to get dressed this morning and demanded that she wear her favorite shirt, her signed Imagination Movers shirt. Guess what? It's filthy. FILTHY. I mean, she wears that thing nearly every single day. But, there was no talking her out of it today. How do you reason with someone who says, "Eva go to hospital get port out? Eva wear Movers shirt!" Dirty shirt, it is. As I mentioned yesterday, I have been a blubbering idiot for the past 48 hours or so. Thought that maybe I would be better today. As we got into the car, you can guess (or "Imagine" as it were) that Eva demanded that we listen to the Movers. The good news is that they have a new cd out that has some pretty rockin' songs on it so that mixes up our collection somewhat. Anyway, back to my blubbering. Was in the car listening and singing along to the Movers when just as we were pulling up to the hospital, the song they wrote about Mothers came on. Eva and Jack love this song and it reduces me to tears each time they sing it to me, anyway. Today? WAY WORSE. Eva screamed as it came on, "Mommy, this is your song!!!" Then, she was in the back seat, "I love my moooom, I love my moooom." After I stopped sobbing, we pulled in. We were told to be at the hospital by 8am for her 10am surgery. So, we got there, got checked in, saw all our nurse friends and Dr. Lenarsky in the hall and then went to the playroom. Eva went into surgery to have her port removed at 10am. About 30 min later, the doctor came out and told us he was finished! VERY fast. A funny Jack note. Yesterday, he got it in his head that he wanted to see the port. I told him that I was not sure it was possible. So, last night, he asked me 15 times to at least ask the doctor. This morning, it was my only instruction. "Do not forget to ask Dr. Kadesky if I can have the port." Of course, the doctor was happy to do it. So, he came bringing us the port in a sealed bag. To say Jack was thrilled is an understatement. He immediately wanted to insert it into some of Eva's dolls. We've either got a budding surgeon or a serial killer on our hands. I'm keeping my fingers crossed for the surgeon. After surgery, Eva took some time in recovery but came out of anesthesia very cheerful. We got in the car and she demanded that I give her ice cream and crank up the bass of the Movers cd. She'll be just fine. That is a good day. The hard part is, of course, preventing her from leaping off of furniture and dive-bombing into stuff. At least today, anyway! Here are some shots at the hospital. First is of Eva and me. Second is Daddy teaching Eva some skills she can use to put herself through college. It's a good day here. I'll keep my sobbing to a minimum. Had tried to hop in the confessional last night but a certain hubby of mine hijacked my computer. I went to bed WELL before he was finished. Lots going on here in Goodnight Mom Land. We've been very busy over here. Have not been posting at all. Don't know why, really. Just tired, I guess. I hate when I go for long periods of time between posts. Strange thing is that I think of things to post all day long. Like, hey, maybe I should write about this or that. Then, I get home, watch TV and crash. I'm so lame. Jack finishes up his pre-K school year tomorrow. My little boy will be in Kindergarten next year. I took Jack to school today because I won't be able to tomorrow. I went to thank his teachers and burst into tears. Then, I went to talk to the school administrator and burst into tears, again. Got into my car and sobbed the whole way into work. The thing is, we have had a LONG year with Eva. It started out with chemo and Jack in constant trouble. Those folks at the kid's school are absolutely amazing. I don't know where we would have been without their infinite patience and support. You know, I happened to have found that school on a whim. I was looking for a place for Jack to go when I was pregnant with Eva so that when she arrived, I would not have Jack sitting at home just staring at her all day. Most mother's day out programs were 9-12p. Too short. OR very expensive. Not an option. I was heading to the library one afternoon and passed this sign for a mom's day out program. I turned the car around and popped in. I signed Jack up before I left that day. We fell in love with the school immediately. We found a home for our kids when we weren't really looking. Then, during Eva's diagnosis and subsequent treatments, the family support we received was amazing. We hardly knew any of the families who brought us food. It was overwhelming. I don't know how we would have done it without that help. Jack had a rough start to the year. With Eva in and out of the hospital, losing her hair, my grandfather dying, it was a tough fall for a four-year old. His teachers were incredible. The difference in Jack over the year, well, I don't think I have enough words to say how grateful I am to them. I just hope they are ready for Eva five days a week next year! Look out!! I'm also sad that several of the families we have become friends with are leaving the school. I know this is the case every year for folks but Jack is in Montessori so the kids are aged 3-6 in one class. Jack has the same teacher for three school years. At the end of each school year, kids leave kindergarten for first grade. Many folks at the school put them in public school at this point. The thing is that you have so many of the same parents in your classroom for several years. So, your kids become friends, you become friends, etc. It is just hard at the end of the year. I'm on the hospital Family Advisory Board and we had a meeting last night. I was chatting with one of the mom's there and she said that although Eva was having a minor surgery, it was monumental in meaning. She was absolutely right. I, of course, since I seem to have no control over my emotions these days (no, I'm not pregnant), burst into tears. This is monumental. It means that the doctors feel that she does not have a high risk of growth right now. I'm so hopeful that it is forever but for now, I'm just so happy. I tried to tell my co-workers the story of going to Jack's school and the port discussion today over lunch. However, I burst into tears and could not finish. Dude, I need to get it together...bad. We had a couple of layoffs at work this week. A dear colleague of mine was let go. It was so hard to see her walk out the door and there is a hole in our small group without her. I know it was entirely a business decision but it really has been tough. We sure miss her. Gosh, I really sound depressed, don't I? I'm really not. Just an emotionally swinging week. Oh, here's something fun. We had a birthday party on Saturday morning at Pump It Up. For those not in the Big D, that is a place that has rooms of inflatables. The mom of the child brought extra socks so that parents could jump around with their kids and play, too. Guess which Mom was first in line? Yep! Yours truly. Jack and I laughed and laughed and jumped and raced each other on the obstacle course. I'm not quite sure which one of us had more fun! Here's the real confession. My elbows are RAW from where I was sliding down the slide over and over. I was laughing so hard that I did not notice my skin ripping away. So, each elbow has a scab that still hurts, by the way! Jack? He's just fine. Eva was hilarious at the party, as usual. When the polka music starts, Eva hits the dance floor. She demands that each one of you get up from the table and dance along with her. I was trying to catch up with some old friends and had to keep dancing! Off to bed. I'll post tomorrow the results of the surgery. We go in at 10a so if you happen to be thinking of Eva, please say a quick prayer for her. Originally from Virginia, I have been living in Dallas for since 2001. 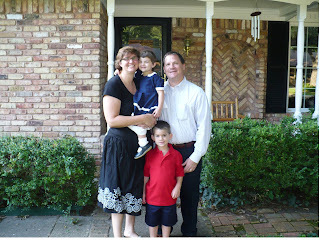 In addition to a wonderful husband, Jon, I have two children, Jack born in 2004 and Eva born in 2006. 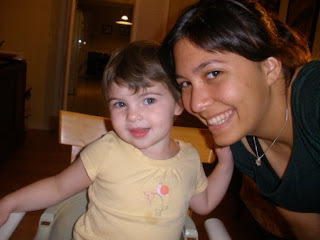 On February 29, 2008 my then 16 month old daughter, Eva, was diagnosed with Stage III neuroblastoma. She has successfully had tumor removal surgery and four rounds of chemotherapy. Neuroblastoma Prayer List--Please pray for these children! My dearest friend and talented poet, Joseph Legaspi, has his first book called Imago. You can order it now on Amazon.com.